Joe De Sciose (judge extraordinaire) says: "I really like the clear sense of place and vantage point of the photo. 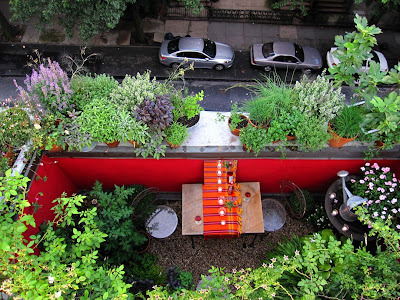 The small terrace and the street below leave no doubt that this is an urban environment. The photo is intriguing as it makes me want to go visit this garden. The red wall makes a great combination with the plants. (It would have been cool if there had been red cars parked on the street or one driving by.) Thoughts that have nothing to do with the photo: I am concerned that the pots on the ledge are secure and will not blow off in a storm. And I ache with empathy for the gardener for the commitment she has made to daily watering. The first photo on Marie’s blog is a fine photograph too but the composition and the background aren’t as interesting. 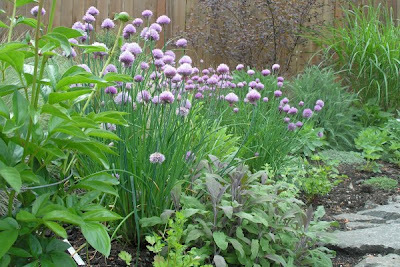 It might be fun to see a shot with the herbs in the foreground and the street or buildings fading off into the background." "Jayme, good color, light and depth of field. But since we offered extra points for photos featuring herbs in an urban setting..."
"Jen, a great moment-in-time shot; you can never go wrong with herbs in a blue pot and a cute puppy in a photo. The soft light is perfect for this type of photo." Thanks to all of you for entering and Marie, please email me at acmeplant@gmail.com so we can get you your fabulous prizes. The pots are secure, and whenever I am in doubt (the plants grow taller, of course), I check them, take them down, do what is necessary...There is actually a wide, 18" gutter along the front of the building, it doesn't read in the photo, but it makes me feel better about acting as a catch net.